On my first day of interning at Risdall McKinney Public Relations I was a little nervous, but I never thought that within two hours of getting to work I would be in tears. Soon after arriving I was whisked away to a radio recording for a nonprofit that benefits organizations that help families who have dealt with SIDS. While sitting in the car on the way to the recording I was informed that this was not going to be the average first day; and it wasn’t. Within the subsequent days I have built up my knowledge of PR. I have successfully written a media alert, learned how to create a media list and of course put in the hours doing normal intern work. After being moved to tears by the radio recording on my first day as a PR intern I learned that a job in public relations is not the average job. There are so many kinds of businesses and experiences that you can offer to your clients that the industry is constantly morphing and the only thing that is consistent is that there is work to be done. There are media alerts, press releases and meetings up the yin yang that the flow of information never seems to stop. Then I realized that like the uniqueness of sitting in the wonderland that is Risdall Marketing Group, PR campaigns have to be equally as unique and that is why I love this job. AdFed - How DOES she do it? Michele Tafoya's "Personal Brand"
Michele Tafoya joined ESPN in 2000 and her profile has steadily risen through a variety of on-air roles, most notably as a reporter for Monday Night Football and ESPN's NFL studio programs. As our guest at the Annual Ad Fed June Luncheon, Michele will guide us through a day, a week, a year of her life and how she incorporates all facets of media into what she does, who she is and how it affects her daily life. Michele is a mid-day talk show host on WCCO-AM, is an ESPN and ABC NFL Sideline Commentator in her professional life as well as being a mother, wife, friend, daughter, colleague, etc. How does she get the word out there about what she does and who she is? Do some forms of media get too personal? How does the media affect her both professionally and personally? Michele lines up her "Personal Brand" for us, not only as she sees it, but how it is shown and managed via print, TV, radio, OOH, Facebook, Twitter, blogs, Wikipedia and more. Come join us at the Annual Ad Fed Luncheon on June 16th, 2010 11:15am-1:00pm at the International Market Square's Studio 185! You could even win a pair of tickets to the Golferoo via Twitter! A contest? It's possible. Hole in one competition at the event? Sure. Register online or contact the Ad Fed office at (651) 917-6251. Registration prices will increase $10 after the deadline of 5:00pm on June 14. REGISTER TODAY! Join Minnesota PRSA for its June Meet and Mingle Event taking place on Carmichael Lynch Spong's rooftop patio. For more information or to register, click on the link below. 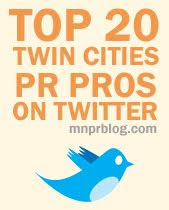 Follow @MinnesotaPRSA for up-to-date event details. Given that the job market can make it a bit challenging to get a job these days, we at Minnesota Public Relations Blog are taking a look at the path to success of people who recently have landed full-time public relations positions. The first person highlighted in the "Journey to My Job" feature is Sarah Haverkamp. 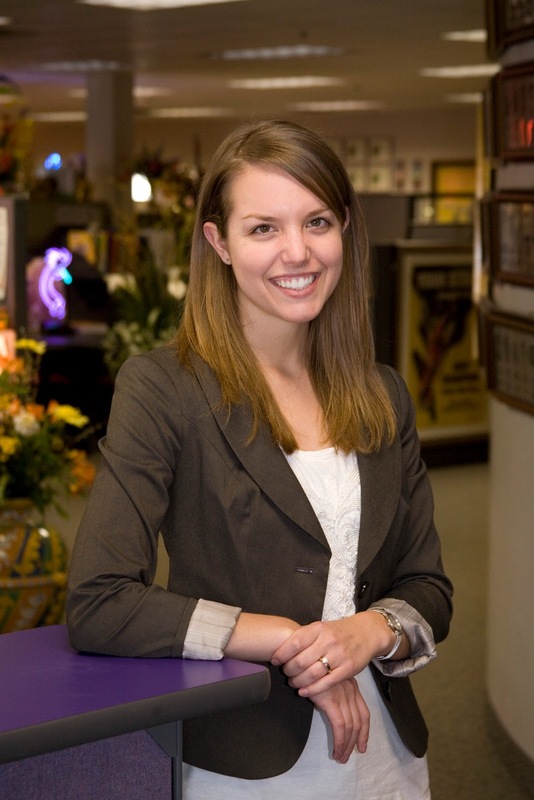 Sarah recently started as an associate communications specialist at HealthPartners. 1. Tell me the path that you took to becoming associate communications specialist at HealthPartners. I started out at HealthPartners as a corporate communications intern. During my internship, I had the opportunity to gain experience in employee communications and media relations. A full-time position opened up while I was an intern, and I was offered the job. 2. What worked well for you in your job search? I reached out to the professionals I knew in the industry. I kept in touch with supervisors and colleagues I had in previous internship positions. I let them know I was looking for a job and I shared my resume with them. By keeping in touch with my contacts, I was able to find job opportunities and let people know I was available if anything opened up. 3. What would you have done differently in your job search? I would have attended more professional conferences, like PRSA conferences, to network more with people and to learn more about the industry to better prepare me for interviews. 4. What advice do you have for job seekers? The best piece of advice I have for job seekers is to keep in touch with old supervisors and colleagues. These individuals are your best advocates in your job search. They have worked with you in the past and know what type of worker you are. They are able to recommend you to their friends in the industry. People are more likely to hire someone who came recommended to them. Also, never think you are too good for a job. Employers are looking for people who want to learn and be team players. Connect with Sarah through LinkedIn. The Buzz about Facebook ... Should we stay or should we go now? Facebook privacy issues and the proposed "Facebook Boycott," have been all the buzz across Twitter and the blogosphere in recent days. Jason DeRusha even posed it for his "Good Question," last night on WCCO: "Are You Going to Quit Facebook?" Well, my answer, is no. I'm not ready to sound the alarm quite yet. But, I do think it's necessary to toss a little water on this raging fire. So, what happened, and why is everyone so upset? People feel that they have been "Zuckerpunched." Take a deep breath ... Face it. Sure, I can appreciate why users are upset with these changes, and have lost trust in Facebook and feel that jumping ship is the best way to make a statement. But, it's not my job to make a statement. I use these tools as a marketing/PR professional. I've spent considerable time and energy focusing on ways to ease clients' apprehensions about social media, counseling them on their social media engagement (Facebook included), and developing ways to adapt traditional strategies and tactics for this environment. What good is it going to do them if I abandon ship? It takes several clicks and checks, but you can lock down the information that you share on Facebook. The Business Insider has published a nice step-by-step guide that covers the majority of the settings. The best way to make sure that your posts don't end up being aggregated into Community Pages, indexed for public search, or shared with third party applications (like Pandora, Yelp!, and Docs) is to make sure that your posts can be seen by "your friends only." (If you're not already using lists to customize which of your followers can see what data and updates, now is a good time to start.) In addition, you'll want to take a look at your "likes." If this is public, you've given consent to share your information. This Mashable post by Adam Rosenberg explains how to create lists and manage these settings. After all of this, you can check your work with this nifty privacy scanner from ReclaimPrivacy. Educate your clients. Don't scare them. Just like when you call someone for help with your drain, you may not really want to know how bad things are down there, or what it is that's clogging things, just what to do to fix it, right? It's our responsibility to get down in the trenches with the mess, and then translate it - in pleasant, relevant terms - for our clients. That "definition" Community Page I referenced earlier? Well, hypothetically, suppose your client has brand representatives on Facebook who haven't locked down their posts. A simple update like, "Going out tonight to have a beer with the guys" could be aggregated onto a community page that is "Beer (Bongs are great)" because some college kid had it listed that way in his/her public profile of things that they "like." This is reputation management, folks, and that's our job. At the end of it all, no, I'm not really a fan - err ... I mean, I don't "like" - the way Facebook has structured these changes and seems to be trying to go head-to-head with Google to engulf the Internet, but the fact remains - there are 400 million active Facebook users. Boycott or not, I'm going to have to walk through the fire if I'm going to be of any help to clients. Weber Shandwick was named Global Agency of the Year for the second year in a row, acknowledging the agency as “the largest and strongest PR brand in the world.” The Minneapolis office and its clients won both Silver and Bronze SABRE Awards last week at the annual U.S. SABRE Award ceremony in New York City. Weber Shandwick with the U.S. Army won a Silver SABRE in the Government Agencies category and a Bronze SABRE in the Blog category. The agency also won a Bronze SABRE Certificate of Excellence with the U.S. Census Bureau in the External Publication category. Risdall McKinney Public Relations (RMPR) last week won one of the nation’s top public relations awards, the Gold SABRE Award, in the “Marketing to Women” category for its work with GoGirl. The campaign by RMPR was chosen over campaigns by notable brands including Frito-Lay, Unilever, Florida Department of Citrus and Milk Processor Education Program. The integrated communications campaign for GoGirl, a female urination device that allows women to pee standing up, was launched in January 2009. Since its launch, GoGirl has taken the feminine convenience market – and the world – by storm. The campaign – including experiential marketing, events, a website, search engine optimization, social media, sponsorships, advertising and retail channel outreach – has been acclaimed by the communications industry for its success. 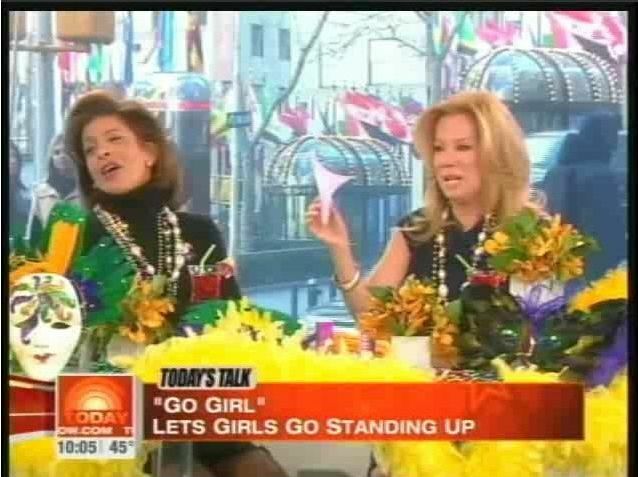 From Twin Cities TV station WCCO to CNN, “The Doctors” and “TODAY,” media fell in love with GoGirl and the opportunity it provides women to stand up to crowded, disgusting, distant or nonexistent bathrooms. GoGirl became an online heavyweight as well with its Facebook and Twitter presence. The newfound ability to go anywhere has resonated with women worldwide. More than 140,000 GoGirls have been sold to date, the product is available from more than 175 retailers nationwide, and GoGirls are being shipped to 18 countries. In addition to The Holmes Group recognizing the campaign with a Gold SABRE Award, the Minnesota chapter of the International Association of Business Communicators (IABC) gave GoGirl and the agency a Bronze Quill Award of Merit last week for the social media campaign. And in March, the campaign won four awards -- “Media Kits (Products),” “Social Media,” “Marketing Products (New – Budget > $75,000),” and “Industry Campaign of the Year (Consumer Products),” at the Minnesota Public Relations Society of America Classics Awards. The Professional M.A. in Strategic Communication program in the University of Minnesota School of Journalism & Mass Communication is accepting applications for its sixth cohort. Applications are due by Tuesday, June 15. Only 20 students are accepted to the program each September. Details about the program and application instructions are online at http://z.umn.edu/stratcommapp. the program focuses exclusively on meeting the needs of the Twin Cities business community. The University of Minnesota is one of only a handful of institutions to offer a professional master’s program in strategic communication designed for the busy working professional. Laura Clementi has been promoted to senior associate at Carmichael Lynch Spong. Clementi joined the firm in 2008 as an associate, after previously serving as an intern for the agency. In her new role, Clementi is responsible for handling day-to-day activities and providing strategic thinking for clients Sherwin-Williams and Trane. Prior to joining Carmichael Lynch Spong, Clementi was a summer events coordinator for Concordia Language Villages in Bemidji, Minn. She also served as a special events intern for the Minnesota Chapter of the Leukemia & Lymphoma Society in Golden Valley, Minn.
Outside of work, Clementi teaches Norwegian for the Norwegian Language and Culture Program. She also serves on the executive committee for the Nordic Lights Film Festival, sponsored by the Twin Cities Associates of the American Scandinavian Foundation. Clementi is an Appleton, Wis. native and a graduate of the University of Minnesota, where she earned a bachelor of arts degree in public relations. The Minnesota Interactive Marketing Association (MIMA), announces the ninth annual MIMA Summit on September 27-28, 2010 at the Hilton Minneapolis downtown conference center, featuring author and high-energy businessman Gary Vaynerchuk and comedian, author, and vigilante pundit Baratunde Thurston keynoting the event. Founded in 2001, MIMA’s annual Summit has become the premiere interactive marketing event in the Midwest. Attracting more than 1,200 industry professionals from all disciplines of marketing, design, media, promotions, content development, product development, publishing, usability and experience design, the Summit offers a half day of Intensive Workshops on September 27, and a full day of presentations from top thought leaders in the industry, unrivaled networking opportunities, smart discussions on the latest trends and topics in the interactive marketing space on September 28. Conference tracks will include, but are not limited to, social marketing, culture, technology, content and user-experience, measurement, search and MIMA’s innovative “Geek Outs,” affording attendees to hear from the next-generation of start-ups and innovators in the Twin Cities area and beyond. Building off attendee feedback from last year’s event, the 2010 Summit will expand to a second day, with day one, September 27, featuring a series of “Intensive Workshops”. These “Intensive” sessions will allow attendees the opportunity to participate with presenters as they dive deep into key topics relevant to marketers. Morning keynote speaker Gary Vaynerchuk is a self-trained wine and social media expert who has revolutionized the wine industry. Gary’s cult-like following is the result of his unconventional, often irreverent commentary on wine, combined with his business acumen and foresight to use social media tools to reach an untapped audience. He hosts a daily webcast called “The Thunder Show” on tv.winelibrary.com that attracts over 90,000 viewers each day, and blogs regularly at garyvaynerchuck.com, dispensing business advice and comments on emerging technologies and cultural trends. Gary’s first book, Crush It! Why Now is the Time to Cash in on Your Passion, was released in the Fall of 2009 and debuted as a New York Times and Wall Street Journal bestseller. Gary continues to focus on VaynerMedia, a boutique agency that works with personal brands, consumer brands and startups, working closely with his brother, AJ. Afternoon Keynote speaker Baratunde Thurston is a comedian, author, and vigilante pundit. He was nominated for the Bill Hicks Award for Thought Provoking Comedy, declared a Champion of the First Amendment by Iowa State, and called “someone I need to know” by President Barack Obama. He has appeared on most major cable and broadcast networks and in newspapers, including the New York Times and UK Independent. Baratunde is the co-founder of the political blog Jack & Jill Politics and performs regularly in New York City, where he works as web editor for The Onion. He hosts Popular Science’s Future Of on the Science Channel, resides in Brooklyn, and lives in The Internet. He is currently writing a book called How To Be Black, which will be published by Harper. Carmichael Lynch Spong celebrated another successful year at the 2010 U.S. SABRE Awards. The firm took home two Gold SABRE awards and one Bronze SABRE award banquet held at Cipriani’s in New York City. Today we're starting a new feature on the Minnesota Public Relations Blog called "A Look at an Up-and-Comer." We will highlight people who, in our eyes, have bright futures ahead of them in the public relations field. Meet Rachel Hart, a recent University of Minnesota graduate. 1. Tell us a bit about your public relations experience so far. My first public relations internship was at MacPhail Center for Music, where I assisted in media relations and marketing for its music programs. I learned the ropes of broadcast with CBS News as a runner for the Republican National Convention. During a summer in Spain, I worked at a local tourist office promoting events and communicating with visitors from all over the world. I most recently spent the year interning at Big Brothers Big Sisters of the Greater Twin Cities as a public relations and promotions intern. Throughout college I gained experience in the U of M’s PRSSA chapter, where I began as an assistant account executive in the student-run public relations firm, then progressed to account executive. I was vice president of our chapter for the 2009-2010 school year. 2. You majored in Spanish in addition to public relations. How have you used that language professionally? What opportunities do you see to use that in your career? While studying abroad in Spain, I combined my communication and Spanish skills while promoting local establishments and activities. At Big Brothers Big Sisters, I was equipped to understand the Hispanic Mentoring Initiative and interpret the Hispanic media coverage that the organization received. Many corporations are trying to tap into the Hispanic community and I foresee using my language skills when interacting with Hispanic media outlets and in dealing with the large Hispanic community both locally and abroad. 3. How has your job search been going? Since graduating, I am focused on finding an internship or full-time position in the Twin Cities. I am currently going through the interview process but I have yet to secure a position. 4. What did you learn from studying abroad in England and Spain? How you represent yourself is everything. Especially with the unfavorable views many people have of Americans, it is important to present yourself as respectfully, articulate, and cultured as possible. I also learned that with all the rich cultures of the world, one size does not fit all, and messages must be catered to fit each unique audience. 5. What is your perspective on social media's role in public relations? It is essential. Information can be updated on Twitter before many news outlets can post on their websites, and it seems Facebook consumes more people’s time than reading the newspaper. Social media is the ideal way to stay connected with customers in an affordable and immediate fashion. I think that if a company does not understand the scope of social media and its ability to connect with constituencies, it is at a severe disadvantage. 6. What is your desired career path? I want to start out in an organization where I can gain hands-on experience and learn from professionals who know the public relations industry. I am very interested in media and corporate communications. I eventually want to end up on the corporate side of public relations, where I can climb my way up the ladder. 7. What advice do you have for fellow job seekers? Network. Network. Network. Even if someone is not able to give you a job, they might know someone who can or they can help you develop skills that will lead to future opportunities. This will also help you realize what you are truly interested in pursuing. Go on informational interviews and try to connect with professionals. I have found that the public relations community in the Twin Cities is very tight and is willing to mentor those who are just starting out. Connect with Rachel through LinkedIn. Steve Knapp has been named director of brand activation, senior partner for Carmichael Lynch. In this role, Knapp will lead the development and implementation of nontraditional media and marketing solutions at the agency. Working with all agency disciplines, he’ll create innovative marketing programs using experiential, social media, mobile, sponsorships and other, still developing platforms. Knapp previously served as vice president and media director for OLSON in Minneapolis. While there, he led the media department, strategic planning and investments for all clients including Fifth Third Bank, Chinet, Northwestern Mutual, the Minnesota State Lottery and General Mills. He successfully increased agency media billings by more than 22 times and department staff by eight times through organic, new business and media-only client growth. Prior to OLSON, Knapp was an associate media director and vice president for Campbell Mithun. During his twelve-year tenure, he worked on major agency clients H&R Block, Kimberly Clark, General Mills (Big G and Betty Crocker brands), Moneygram, Land O Lakes, and UnitedHealth Group. Knapp has won numerous awards for his work including Media magazine’s Creative Media Award, Mediaweek Media Plan of the Year Award, multiple EFFIE awards and a 2008 Marketing Sherpa Viral Hall of Fame award. Knapp received his bachelor of arts in mass communication and minors in history and international studies from the University of Minnesota, Duluth. Fast Horse to Hire Summer Intern Via Facebook! Minneapolis -based Fast Horse is launching a unique search for a new summer intern via Facebook – taking its use of social media to a new level in an effort to identify creative, young talent. Fast Horse is asking qualified candidates to submit resumes and “video cover letters” as part of the application process, and the job will be awarded based on results of a vote on the agency’s “Fast Horse Experience” page on Facebook: www.facebook.com/FastHorseExperience. The three-month paid internship includes an opportunity to work with Fast Horse clients, including The Coca-Cola Co. , and a chance for the summer gig to turn into a full-time position. Applicants must include a short video demonstrating creativity, personality and initiative. Fast Horse will interview top candidates in person or via Skype and select three finalists before turning the hiring decision over to the Facebook community. Applications must be received by 5 p.m. on May 28. Visit www.fasthorseinc.com for detailed submission instructions and criteria. John Schneider has joined Beehive PR as group director, digital and social media strategy. Schneider will lead Beehive’s digital, social media and interactive services, as well as direct the agency’s internal digital and social media development. Schneider began his professional career while still in college, growing his restaurant company to 100 employees in only four years. In 2000, he continued to follow the entrepreneur path, launching design and branding firm GESTALT, which most notably rebranded and helped launch Geek Squad into 700 Best Buy stores across North America. Five years ago, Schneider joined Larsen Design where he helped develop the firm’s interactive practice and worked on major brands such as Blue Cross Blue Shield, Buffalo Wild Wings and American Medical Systems. Most recently, he served as a marketing consultant leading initiatives including social technology strategy, website conversion strategy, and active analytics measurement and monitoring for a variety of clients in the technology and publishing industries. Schneider holds a bachelor’s degree in history and political science from Macalester College and a master’s of business administration in marketing from the University of St. Thomas. He also studied design and has been an adjunct instructor at the Minneapolis College of Art and Design. Schneider is a frequent speaker at conferences and is active with several professional associations and student-related activities. When: Tuesday, May 18 | 1-4 p.m. This workshop focuses on improving productivity – using writing as a powerful tool for getting things done. Attendees will learn how to write quickly and effectively, saving time for themselves and their readers. They will impress others with their ability to get to the point quickly, clearly and concisely. Project managers will especially appreciate learning how to more effectively meet important deadlines and keep projects on target. Workshop objectives: The skills/concepts provided in this program teach people to present their ideas clearly in all business communications, regardless of length or medium: including letters, memos, reports, business decision documents, voice mail and e-mail messages. Stan Berry has devoted the past 34 years to improving the writing skills of over 55,000 business and government professionals. After completing his Master’s degree from Yale University, he co-authored five books on writing that he uses in his seminars. He’s been a member of the American Society for Training and Development (ASTD) since 1975 when he served as the newsletter editor and on the Board of Directors for the Twin Cities Chapter. Free parking permits will be sent via email to all attendees who register before 5 p.m. on May 16. Permits will NOT be provided onsite, so you must register to receive a parking permit. Permits are valid in the O’Shaughnessy/Event Parking lot, which can be accessed from Gate 4, and the Visitor Parking lot, which can be accessed from Gate 3. NOTE: If you plan to register at the door, MWMC can only accept payment via cash or check; credit cards will not be accepted at the door. PR Agency Profile - Haberman Inc.
Haberman is a brand public relations firm that tells the stories of pioneers who are making the world a better place. Since 1994, Haberman has grown from its husband and wife founders to include a staff of 26. 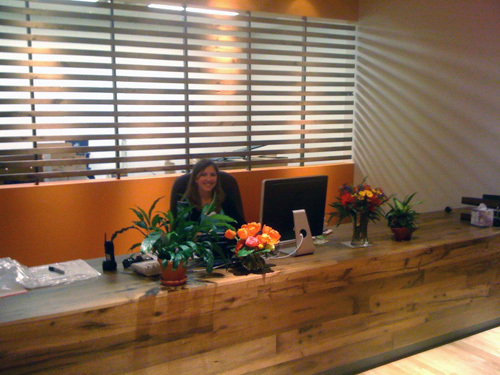 The firm recently moved to new office space in the historic Kickernick Building in Minneapolis' Warehouse District. Named by FastCompany.com as a top brand storyteller in the nation, Haberman engages the hearts and minds of its employees to support forward-thinking, mission-driven organizations. Haberman storytellers have created and managed dozens of public relations, marketing and social media campaigns for some of the nation's most well-established brands and industry organizations in the sustainable lifestyle sector. Currently, Haberman is conducting campaigns for Organic Valley, National Cooperative Grocers Association, the Institute of Agriculture and Trade Policy, Annie’s Homegrown and Annie’s Naturals, Room & Board, Wedge Community Co-op, and the Organic Trade Association. The firm also represents a wide variety of progressive brands and causes, including Volvo, Sunrise Community Banks, Community Reinvestment Fund, and the Minnesotans’ Military Appreciation Fund, as well as pioneering technology and health-related organizations, such as Entropy Solutions, Inc., Stratasys, CodeWeavers, RedBrick Health and West Side Community Health Services. Dedicated to leading its own pioneering initiatives, Haberman is the creator of the U.S. Pond Hockey Championships on Lake Nokomis, dubbed a must-see event by ESPN.com. The firm also created its own employer-sponsored garden in 2009 to further immerse itself in the food and health sectors. Employees work in the garden and reap the benefits of fresh vegetables, while deepening their understanding of how to grow food and live a healthier, more sustainable lifestyle. Haberman is leading a national movement to encourage other companies to plant gardens to help reduce the nation’s health care costs. Haberman hosts a Facebook page (www.facebook.com/modernstorytellers), a Twitter feed (www.twitter.com/modernstories) and a blog (www.pioneerosis.com) in addition to its business website at www.modernstorytellers.com. Weber Shandwick received the top industry award at the 2010 International Association of Business Communicators (IABC) Minnesota Bronze Quill Awards Gala. The agency won the IABC Pinnacle Award for its client, Dairy Management Inc., and issues management and crisis communications project entitled, “Preparing for a Dairy Safety Crisis.” The Pinnacle Award bestows honors on the highest-scoring award entry for the Bronze Quill, a program honoring Twin Cities’ professionals for excellence in business communications. The Bronze Quill Awards Gala is an annual event that supports the professional development of communications professionals in the field. This year, judges from three IABC chapters evaluated 56 entries. Those entries receiving a score of five points or higher, moved on to a second round of judging by a panel of accredited IABC professionals. Entrants were asked to follow comprehensive guidelines and were judged on a seven-point scale based on the entry’s comprehensive plan, measurement and work sample. Three Awards of Excellence (scores between 5.75 – 7 points) and 10 Awards of Merit (scores between 5.25 – 5.74 points) were given to local business communicators. In addition, Martha Nevanen was presented with IABC’s 2010 President’s Award and Vanessa Szpara was recognized as IABC Minnesota’s Outstanding New Volunteer of the Year. Padilla Speer Beardsley announced today that Dean Huff has joined the firm as senior vice president of its agriculture and environmental sciences practice. Huff brings nearly 20 years of experience in strategic communications planning, integrated marketing and agency management to the firm. In the agriculture and environmental-science arenas, Huff has led highly successful integrated communications and branding campaigns for multiple clients, including pest-management and crop-protection companies, as well as lawn-and-turf product manufacturers. Before joining Padilla, Huff was CEO of Insight Marketing, a Minneapolis firm he founded in 2005. Previously, he served as an executive at Colle+McVoy, as well as an account supervisor at The Martin Agency in Richmond, Va., and Miller Meester in Minneapolis. Huff is a graduate of the University of Illinois-Champaign, where he earned his bachelor’s degree in communications with a specialty in advertising. Approving Ads? Morsekode has an app for that! If finding the hottest bar around the corner or turning your phone into a light-saber has found a home on the iPhone – why not an app that allows busy marketing professionals to review and approve ads on the go? That’s what the folks at Minneapolis-based creative marketing agency Morsekode were thinking when they developed the Brand Motion iPhone app for their clients. Clients are able to log in to the application and review their online videos, advertisements and other marketing material at critical approval stages of a project. Comments are easily shared with links to the agency team to keep the creative process moving. “Morsekode has made viewing our creative projects so simple with their Brand Motion iPhone app,” said HaiVy Thompson, marketing communications consultant with HealthPartners. “It's very easy to install and use. Having their Brand Motion app gives me the ability to roam more freely, within the office or out — even during project crunch time." A majority of Morsekode’s client work involves video and interactive elements for a diverse group of national and global brands. The app is a tool that every client of the agency can take advantage of and provides a new level of client service. Weber Shandwick today announced the promotions of Andy Keith, Greg Swan, Tim O’Regan and Mary Elizabeth Sisk in its digital communications practice. Andy Keith has been promoted to digital account director. Keith joined the agency in April of 2008. He is a graduate of Lewis and Clark College and has a focus on business-to-business social marketing strategy. Greg Swan also has been promoted to digital account director. Swan joined the agency in September 2005. He is a graduate of Drake University and leads social marketing for the U.S. Army account. Tim O’Regan has been promoted to digital account supervisor. He joined the agency in June 2004 and is a graduate of St. John’s University and The Art Institutes International Minnesota. O’Regan’s expertise is in social marketing strategy and video production. Mary Elizabeth Sisk has been promoted to digital account executive, working on social marketing strategy and execution. She joined the agency in January 2008 and is a graduate of the University of South Carolina. Risdall Marketing Group (RMG) boosted its client roster throughout spring, with the firm adding seven new client accounts in April. So far in 2010 the firm has added 28 new accounts. In 2009, RMG added 106 new or expanded client accounts. Minneapolis-based public relations firm, Padilla Speer Beardsley, is named Best Large Agency to Work For by Holmes Report, a national leader in providing insight, knowledge and recognition to the public relations industry, http://www.holmesreport.com/story.cfm?edit_id=11382&typeid=10. Earns a reputation as one of the best managed firms in the country, which leads to its continued growth. Looks first to existing employees and friends of the firm for candidate referrals. Helps employees to “keep learning” through professional development programs called Padilla University. 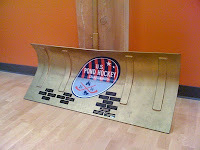 Gives back to the communities where its employee-owners live – honored with Minnesota Keystone Award. Job - General Mills - Multicultural - Community Public Relations Assoc. General Mills - Multicultural - Community Public Relations Assoc. Whether you’re an individual looking for the perfect job, internship or exciting volunteer opportunity, Minnesota PRSA’s Career Center can help. Minnesota PRSA’s Career Center provides career, internship and volunteer opportunities for members. Questions? Please contact Career Center co-chairs Sarah Cothran or Susan Beatty. Laura Jensen has joined Risdall McKinney Public Relations as an assistant account executive. Jensen graduated from Iowa State University with a bachelor’s degree in journalism and mass communications. Prior to joining RMPR, Jensen interned at Blue Cross Blue Shield of Minnesota and the Des Moines Register. Weber Shandwick today announced the hiring of two new employees in the agency’s digital communications and consumer marketing practices. Emily Norine has been hired as an interactive and print project manager in the digital communications practice. Her role will support the development of printed branding assets and collateral, websites, interactive press kits, e-newsletters and e-mail campaigns for a range of clients across the agency. Before Weber Shandwick, Norine spent three years as an account coordinator in Thomson Reuters’ creative services department where she managed projects for print, Web, e-commerce and district marketing clients. Norine received a bachelor of arts in theology from Calvin College in Grand Rapids, Mich., and spent a semester studying at Oak Hill Seminary, Middlesex University in London, England. Leslie Hopp has been hired as assistant account executive upon completion of her internship in the consumer marketing practice. Since joining Weber Shandwick, Hopp has supported the 2010 Census and Kemps accounts, assisting with results measurement and reporting for proactive and reactive media relations. Prior to Weber Shandwick, Hopp worked at Delta Sky Magazine as an editorial assistant and held internships at Corporate Fox Sports West, McFarland Cahill Communications and the Republican National Convention. Hopp graduated with a bachelor of arts in public relations and minor in business administration and in classics from the University of Southern California. Tunheim Partners, a strategic communications company, today announced that Prevent Blindness America, a Chicago-based non-profit, has selected the agency to help it advance its mission of preserving sight. Tunheim Partners will provide strategic counsel, social and traditional media strategy and execution, as well as event logistics to support Prevent Blindness America’s enhanced marketing and development efforts throughout the U.S. Spurred by organic growth with existing clients and on the new business front, Preston Kelly promoted two employees within different departments. Both Sherri Carmichiel and Jaime Westlund have worked with the advertising agency for several years and welcome the opportunity to deepen their responsibilities. With her 13-year tenure at the agency, newly promoted Accounting Manager, Sherri Carmichiel, knows a thing or two about Preston Kelly’s history. Originally hired as a Production Accountant at the agency—then called Kerker—Carmichiel has had ample opportunity to flex her muscles in client accounts payable, billing and fee analysis, and general year-end auditing. In her new role with Preston Kelly, she will also focus on month- and year-end account reconciliations, manage all types of client billing and forecasts, and handle fixed asset management. Carmichiel is a seasoned accounting professional, with more than 20 years of experience gained in the world of advertising. Newly appointed Senior Connections Planner, Jaime Westlund, has spent the last four-and-a-half years working on various Preston Kelly accounts, including Roundy’s Supermarkets, Inc., Mall of America, Nickelodeon Universe, National Marrow Donor Program and Baker Tilly. With 11 years of media planning and buying experience under her belt, Westlund juggles media placement opportunities across a range of disciplines, such as broadcast, print, out-of-home, digital and nontraditional media. Prior to joining Preston Kelly as a Connections Planner, she studied journalism, advertising and public relations at the University of Wisconsin-Madison, and worked for TeleRep, Inc. in Minneapolis and Mindshare in Chicago. As Preston Kelly looks to the future, the agency views the promotions as a vital step in its ambition to gain national recognition for its work with a large roster of clients, including new additions Grand Casino, operator of two top gaming facilities in Minnesota, and Baker Tilly, a national accounting firm. Despite all the doom-and-gloom news about post-recession hiring, Preston Kelly has bucked the trend by filling eight new positions across several departments in the first three months of 2010. The hires are fueled by the organic growth of clients and a series of new business wins by the advertising agency, including Grand Casino, operator of two top gaming facilities in Minnesota, and Baker Tilly, a national accounting firm. After nine years spent in Arizona, Colorado and Illinois, Jess Wangsness landed back in her home state as Preston Kelly’s new Public Relations Manager. In her many travels, Wangsness earned graduate degrees at the University of Arizona and the Medill School of Journalism at Northwestern University, and developed her media savvy in the business of cross-platform magazine publishing. 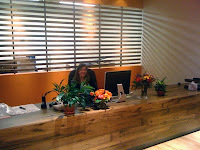 Her collaborative role at the agency includes a blend of social media, conceptual PR and new business development. A number of highly qualified and experienced candidates applied for Preston Kelly's new copywriter position. Brett Knutson was selected based on his experience working with brands such as Target, UV Vodka and Chinet. Along with his agency and freelance experience, Knutson was an army sergeant and earned degrees from Miami Ad School, Bethel Seminary and University of Wisconsin-Eau Claire. After completing an internship at Preston Kelly, Emily Jolly made the leap to full-time employment as an Interactive Project Manager. In her integrated role with the agency, she will project manage banner ads, email campaigns and mobile programs, in addition to serving as a vital link in search engine marketing and social media initiatives. Jolly is a recent graduate of the University of Minnesota with a major in advertising and previously interned at the Twin Cities radio station KS95. After two years as a Media Buyer/Planner at Russell Herder, Chris Luna joins Preston Kelly as a Connections Planner, a collaborative role that will blend his flair for number-crunching and his aim to devise the next great media placement ideas. Before maneuvering into the “real world,” Luna studied at the University of Minnesota’s School of Journalism and Mass Communication. Kate Zingsheim also transitioned smoothly into the ranks of full-time employees after an internship with the agency. Before taking the reins as Preston Kelly’s newest Assistant Account Manager, Zingsheim graduated from the University of Wisconsin-Madison, where she also worked for RJ Schinner, a supply source for wholesalers. After attending the Extra Bold Portfolio School in Madison, she moved to Minneapolis, taking an internship at Hunt Adkins and Preston Kelly, respectively. Michael Diener joins Preston Kelly as a Production Artist/Designer after developing his advertising chops as a freelance production artist and designer for brands such as Minnesota Mosaic, LensCrafters and General Mills. Diener studied graphic design at the University of Minnesota. In his new hybrid role at Preston Kelly, he will employ his skills in the agency’s production and creative departments. As Preston Kelly expands, it figures that the agency would need to beef up its internal accounting pool. With the recent hire of Lucas Hansen as Accounting and Benefits Manager, the agency gains a go-to person to answer questions about benefits, client billing information, forecasts and budgets. Prior to joining Preston Kelly, Hansen served as an accountant with Clarity Coverdale Fury. Unemployed? Check out Pros on Hold! Minnesota Women in Marketing and Communications (MWMC) has expanded its Pros on Hold membership category to include those who have recently become unemployed. The Pros on Hold membership was originally created for women who had taken leaves of absence to care for family. “We felt there was a group of people who were missing out on the benefits of being a member of MWMC so we've decided to change our Pros on Hold membership to include individuals that have been laid off within the last 12 months,” said Michelle Josephson, Membership VP. The annual dues for a Pros on Hold membership are $58. Pros on Hold are required to volunteer a minimum of eight hours a month and serve on an MWMC committee, giving them the opportunity to invest in their professional development, maintain their skills and network with women throughout the communications industry. If you are interested in joining MWMC, please contact Michelle Josephson.